Specialization is the key to success for many travel professionals. To help you excel and effectively sell one of the world&apos;s most spectacular destinations, Tourism Vancouver has designed the Vancouver Specialist Program, an interactive online training program that will provide you with the knowledge to increase your sales and deliver tailored itineraries for your clients. 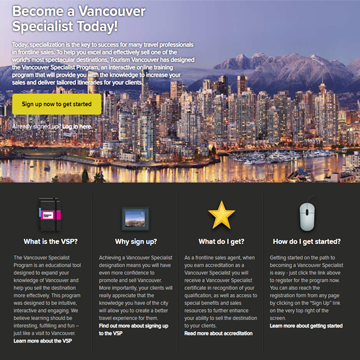 The Vancouver Specialist Program is an educational tool designed to be intuitive, interactive and engaging. 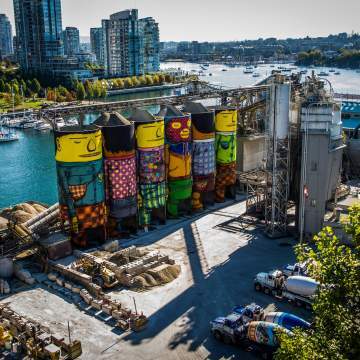 We believe learning should be interesting, fulfilling and fun – just like a visit to Vancouver. When you earn accreditation as a Vancouver Specialist, not only will you receive a Vancouver Specialist certificate in recognition of your qualification, you’ll also earn access to exclusive benefits and sales resources such as the Virtually Vancouver webinar series to further enhance your ability to sell the destination to your clients. Each webinar is offered at different times of the day to allow international markets to participate, with topics covering areas such as cruising, family friendly travel and new products. Get started on the path to becoming a Vancouver Specialist at vsp.tourismvancouver.com and start learning about our destination at your own pace. Check out our video to learn more!